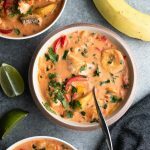 Simple, spicy, and swimming with veggies, this Whole30 Brazilian Fish Stew makes a quick and comforting weeknight meal. Add cod pieces, lime juice, and ginger to a shallow bowl, gently mixing to coat the cod and distribute the ginger. Set aside and let marinate while you start the rest of the stew. Heat olive oil in a dutch oven or pot over medium heat. Add garlic, crushed red pepper, onion, and bell pepper strips, sauteing for 5-8 minutes or until veggies have softened and garlic is fragrant. Add the chopped tomatoes and plantains and stir, cooking an additional 2 minutes. Transfer cod from the marinade to the dutch oven, nestling the cod pieces in the veggies. Sprinkle with salt and pepper. Discard the marinade. Stir the paprika, broth, and coconut milk into the dutch oven. Reduce heat to a simmer, cover, and cook for 10 minutes, until the fish flakes easily with a fork. Stir in cilantro and serve immediately.